Removed from a career of iconic uniforms with the Mexican national team and the L.A. Galaxy, Jorge Campos talks about the game that shaped him. 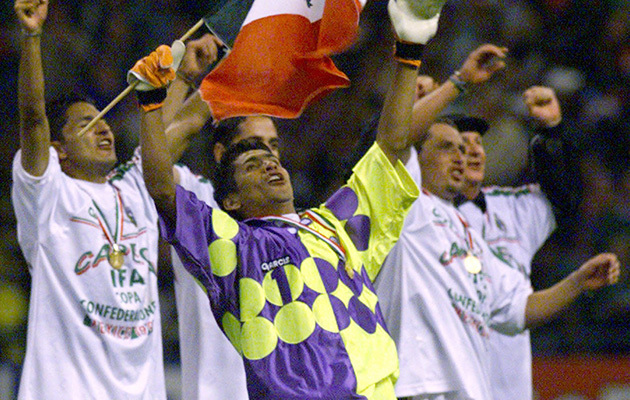 Midnight on a spring Wednesday at LAX finds Jorge Campos about as motionless as when he roamed the goalie box—and the rest of the campo—for the Mexican national team throughout the 1990s. He is hustling from a long-term parking garage toward one of the dozens of flights he will catch between California and Mexico this year, his nomadic ways having changed far less over the years than his manner of dress. The gray jeans and sweater Campos wears as he enters Terminal 2 represent a complete parching of the palette that once splashed neon in every conceivable color, often all at once, across his custom-made goalie kits. The diminutive Campos (at 5’ 6”, he’s a full foot shorter than Chelsea goalkeeper Thibaut Courtois) didn’t play futbol as much as he experimented with its boundaries. Over the 130 international matches he played wearing Mexico’s colors—or, rather, wearing his own colors while competing for Mexico—he became known not only for his acrobatic saves and punchaways, executed in leaping rainbow arcs in front of the Mexican goal mouth, but for the threat he posed afterward: that he might rise from the pitch, roll the ball to himself and dribble upfield on the counterattack. Today, with rare exception, that kind of thing is reserved for the fetishist corners of YouTube. Campos showed off that unpredictability in some of the world’s largest stadiums, where he’d just as soon create a shot as pluck one out of the air. On second thought, maybe playing is exactly what he did. “It was a special position,” he says of the freedom he was given to freestyle. “Now it is more—I don’t know how to say . . . it’s more strict. Midfield, defense, right, left, center.” As if his playing style weren’t revolutionary enough, Campos seized our sartorial imaginations by donning uniforms—baggy surf shorts and oversized polo shirts, collar always turned up—that looked as if Montezuma had eaten radioactive tacos before ejecting his fluorescent revenge into Campos’s locker. “I’m from Acapulco,” Campos explains, resting for a minute in an airport coffee shop. “The beach, surfing—I didn’t get to the ocean every day [growing up] . . . But every weekend? Definitely. So I was thinking: If I can’t surf anymore, I’ll bring the style, the shore, the coloring, to soccer. A lesser man might be bitter about the lack of remuneration he received for revolutionizing goalie apparel worldwide, but Campos genuinely doesn’t seem to understand the adjective “bitter”. He just unfurls another childlike laugh—eyes closing, crow’s feet deepening—warming his corner of the deserted terminal. Campos says he wants to be remembered for his tenure with the Mexican national team, which included victory at the 1999 Confederations Cup. Campos politely declines to talk about his family, most likely because his father—his boyhood coach and best friend—was kidnapped in 1999 from an Acapulco park named after Jorge. (Alvaro Campos was held for ransom for six days before being freed; he died in 2013.) This brush with darkness would help explain why the younger Campos craves both anonymity and fellowship these days, why he wants to love the people more than they love him. Campos can walk around unnoticed in the States far easier than in his home country. Ever playful, he delights in messing with those who spot him, wherever they are. “They go, ‘Are you Jorge?’ ‘What?’ ‘You look like Jorge.’ ‘Nah, I hear that a lot.’ ” More laughter rockets off of LAX’s stone walls. “I play golf with guys and they ask, ‘What do you do for work?’ I say, ‘I work in soccer.’ They say, ‘Did you play?’ ‘Eh, a long time ago.’ ” Not so long ago, though, that he couldn’t place a diving header in the back of the opposing net in a Mexican legends game in May. The legend remains a fan himself. “I like to watch [Manuel] Neuer, from Bayern. I think he’s the best goalie in the world. He’s amazing.” Yet only a keeper with Campos’s on-field wanderlust could admit that Lionel Messi, Cristiano Ronaldo, Neymar and Iniesta are his favorite players. With that, the Acapulcan sprite who took the game of soccer into his goalie-gloved hands and squeezed it until it oozed between his fingers—into arcs the shape of his goal-thwarting leaps, the shape of his sidewinding journeys down the pitch—rises, shakes the stranger’s hand, offers the tiniest bow and makes a gentleman’s exit.